This is the link to a video of the Art Couture Festival that took place on 13th July on Stroud Community TV that features Hattie: http://stroudcommunity.tv/art-couture2014/. Link to Behind the Scene Gloucestershire - http://issuu.com/gloszine/docs/issue10/1. See the gig guide. Hattie's radio coverage - BBC Radio Gloucester, Croydon Radio and Dapper FM and recently reached Australia - "Where your love should be" aired on TrackSuits on fbi radio - to listen, click here and go to about 10 minutes into the show. "Old Eyes' was aired last Sunday night by Alex Huskisson, on Severn FM - "The Mystery Train Show" starting at 10pm. Click here and go one hour and 10 minutes in. For his review (and others) of Hattie's progress and new tracks, click here. Hattie playing "Fields of Gold" at the Monmouth Festival. FROM the second that the statuesque and supremely composed figure appeared, we, the eagerly awaiting audience, knew that we were in for a truly magical experience, and Hattie Briggs and her musicians did not disappoint! As her first notes soared upwards to swell and fill the air around us, we were held transfixed, mesmerised and spellbound by the staggering range, quality and expression in that sound. To say that Hattie Briggs can use her voice like a highly tuned instrument is the understatement of the century! From beginning to end she took us all on a rollercoaster ride of emotions. She lifted our hearts with soft, lilting melodies like Where your love should be, Just You and I, God Speed and Happy in your Arms. She melted them with her soulful lyrics, such as Beautiful Mind dedicated to Pete Seeger, Old Eyes, and the touching Tilly’s song written for her friend Tilly. All who walked out into the summer evening were left in no doubt that they had just witnessed the birth of a star and are all really looking forward to the release of Hattie's album later this year. 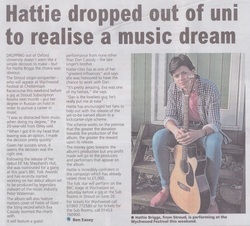 Shortly after this article appeared, Hattie was interviewed by Johnny Coppin on Radio Gloucestershire. He played Tilly's Song. This is the link to the programme, and the track is playable from here"http://www.bbc.co.uk/programmes/p02050mb. Wednesday 26th April - Excellent Review of the gig at the Frog and Fiddle by John Datchens - http://issuu.com/gloszine/docs/issue_6. Page 3. Sunday 6th April and Sunday 16th March - Severn Radio - Alex Huskisson featured Hattie's single, on the Mystery Train Show, which has recently moved from Stroud FM to its new home on Severn Radio. Alex has been featuring Hattie for several weeks and attends her gigs when he can. It was announced that Hattie has won an award from Stroud Community TV for Best Stroud Music Film of 2013. Follow this link for the full story. http://stroudcommunity.tv/awards-2013/ including details of the 14 judges. 6th March Interview on Somer Valley FM and live performances for Rob Bayly. We had a great chat interspersed with about 7 tracks from me over the space of an hour - a very enjoyable way to spend the morning. The show will be repeated on Tuesday for those who missed it, but you can also catch up here http://www.podcasts.canstream.co.uk/svalley/index.php?cat=Rob%20Baylys%20Eclectic%20Select - I was there in the second hour, the top link on the page. Enjoy! Saturday 1st March - Hattie's 20th June gig at the Subscription Rooms has appeared in their newly published Events Brochure. Wednesday 19th February - this is the link to the interviews carried out by Simon Mayo of BBC Radio 2. 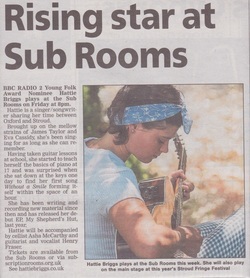 Hattie played "Pull Me Down " in the Green Room to Simon Mayo, John Boden of Bellowhead amongst others. The interviews were broadcast live on BBC Radio 2. Tuesday 18th February - Hattie was interviewed on Radio Gloucester by James Thomas on the Claire Carter afternoon show. James aired "Pull Me Down", and she was interviewed and played "Tilly's Song" live later by Seb Choudury and Alex Lovell on the 6.30 pm BBC1 Points West show. 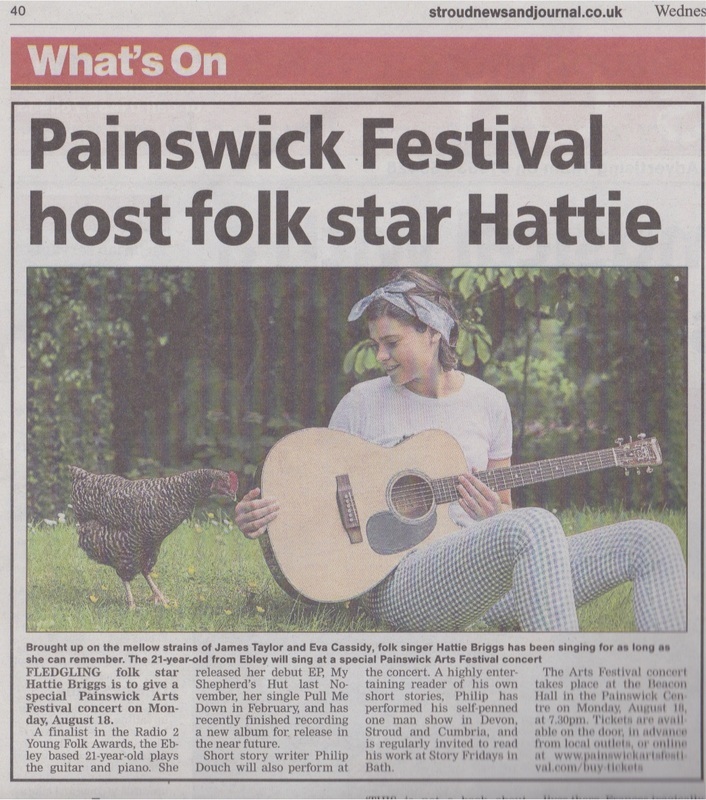 Hattie has received a lot of press coverage in Gloucestershire from the Stroud News and Journal (see above), the Citizen and Stroud Life and in Sussex from the Chichester Observer. An article will be appearing in Cotswold Life soon. Radio coverage has been building since her first appearance on Claire Carter's show on Radio Gloucestershire. One of the tracks from Hattie's EP, "Where your love should be" was aired during the recent Mark Forrest BBC Introducing show which is broadcast in 39 counties all round the UK including Bristol, Berkshire, Wiltshire, Tees, Devon, Sussex, Surrey, Oxfordshire, Cumbria, Merseyside, Shropshire, Stoke, Gloucestershire, Cambridgeshire, Lincolnshire, Warwickshire, Somerset, Kent, Norfolk, Yorkshire, London and the Channel Isles. Jess Bracey of Stroud FM was the first presenter to play "Pull Me Down". Jemm 2 Radio, an internet station, are adding her songs to their playlist. Saturday 18th January - Tilly's Song played again on BBC Introducing. Tuesday 17th December - Tilly's Song written by Hattie was played on the BBC Introducing Show presented by Mark Forrest at 9.50 pm, ten minutes before the end of his show if you want to catch it on iPlayer. Mark's Show was broadcast in more than 10 counties so lots more people had the chance to listen to her. One new fan heard it in Australia and got in touch with her. Another lady heard it in France! BBC Introducing West (@bbcintrowest) aired Hattie's live session with presenters Richard Pitt and Sam Bonham on the 30th November via Radio Bristol, Radio Gloucestershire, Radio Somerset and Radio Wiltshire . The programme started at 8pm, and was repeated at 1 am for serious night owls. You can listen to it via the BBC Introducing West web page. http://www.bbc.co.uk/programmes/p01lkksg. Hattie's session starts 1 hour 4 minutes into the programme and features her playing three of her own songs: For Now, Tilly's Song and Where Your Love Should be.